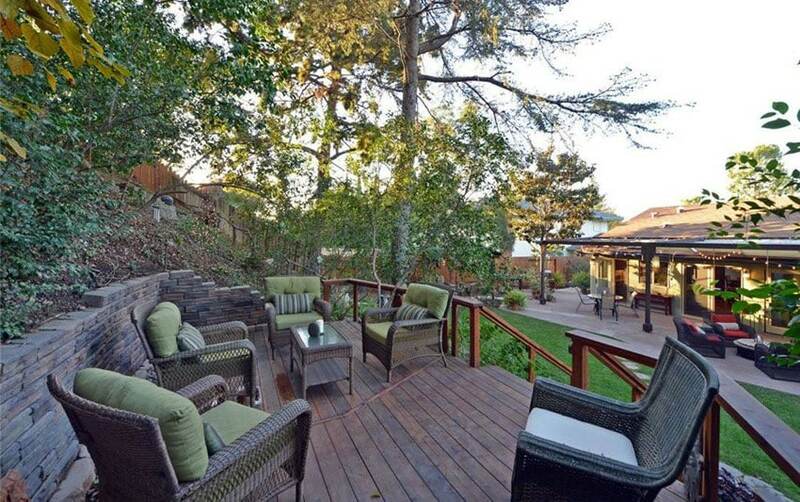 Welcome to our backyard deck ideas picture gallery. 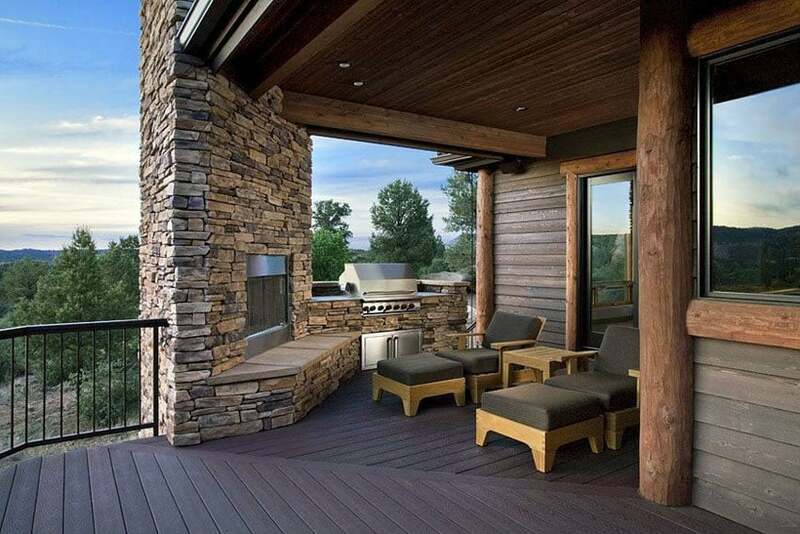 These wood deck design ideas feature a wide variety of decks of all types, shapes and sizes. 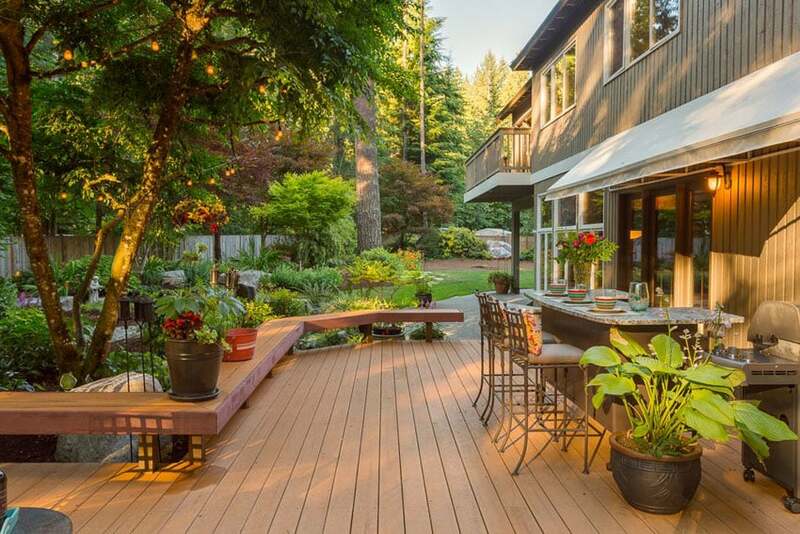 An outdoor deck is a great way to maximize your home’s living space and connect the indoor living area with your backyard. 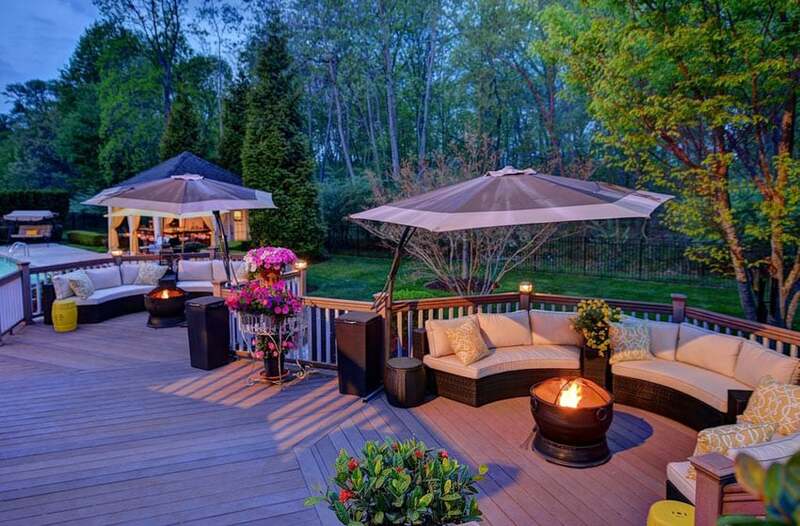 We hope these deck ideas will help give you plenty of inspiration for creating your own perfect backyard retreat. Composite Decking – Using a combination of wood and plastic a composite deck requires less maintenance than traditional wood products. In addition it doesn’t require the staining and sealing associated with real wood to help keep it looking new. Composite is also splinter free making it easy on the feet. One of the minor downsides is composite decking materials usually cost more to buy at the beginning. However, once one factors in maintenance cost over the years it could actually cost less over time. Wood decking – Natural wood is beautiful and provides an attractive look for creating an impressive backyard deck. The downside is wood can require more maintenance with staining and sealing to keep it looking great. There are a wide range of material used in wood decks with availability usually depending on where you are located and what types of wood products are being sold there. The most popular types of wood used in deck construction is pressure treated lumber usually made from yellow pine. 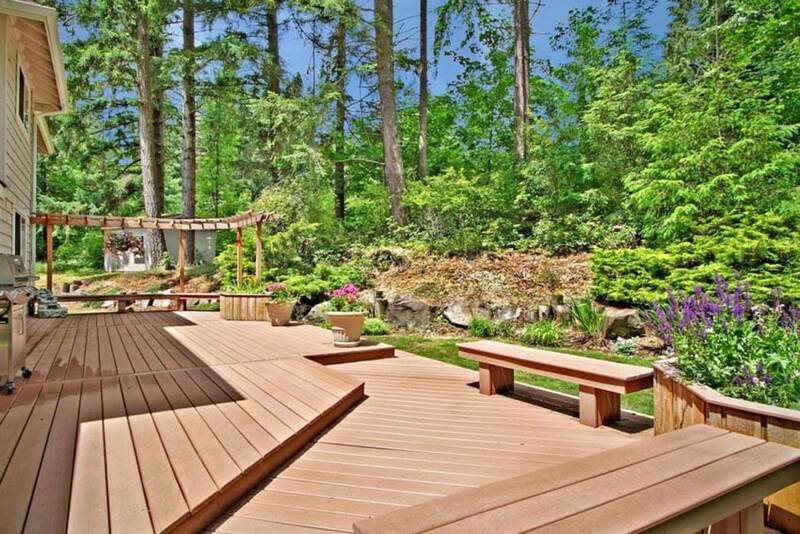 However, for luxury decks many homeowners opt for the rich beauty of cedar, mahogany or redwood. In the image above, the backyard wood deck design is integrated into the swimming pool of a modern home. With lounge chairs, a hot tub, and the warm glow of the indoor lights, this deck was made for rest and relaxation. There’s plenty of room on the deck for lounging and the elevated wood planters frames the house and really complements its landscaping and exterior. Below are a variety of deck ideas for inspiration for your home. Once you have a found some styles you prefer there are a number of deck design software programs available to help bring your idea to life. This option will help you determine what you want and save time and money if you decide to hire a professional deck contractor or architect. A contemporary piece of design, this wrap-around deck uses sleek metal railings, an L-shaped couch, and a minimalist design sense to create a unique outdoor experience. Outdoor decks sometimes use variations in floor finishes to indicate different areas or spaces. This beautifully decorate outdoor design has a garden area and canopies to keep itself cozy and inviting. This wood deck uses a flower planter to put in some nice color into the space. 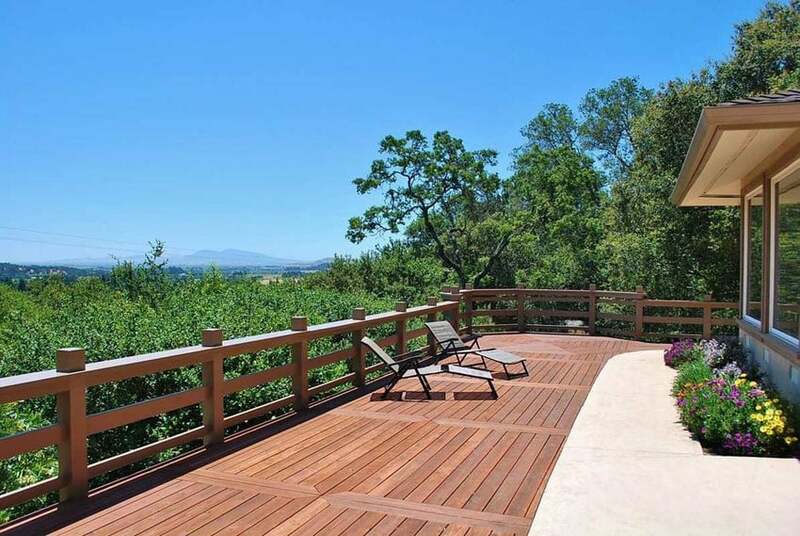 That, coupled with the amazing views that can be seen on this wood deck makes this space ideal for quaint gatherings or even just personal lounging time. Decks used for modern home outdoor spaces are typically subject wear and tear. The use of composite decking materials are ideal for those situations. Here, we have planters and water features as well. This composite deck located in a nook under the house is perfect for intimate family or personal time. The outdoor fireplace and the outdoor grill equipment provides various options for activities in this space. The long, outdoor L-shaped white couch really gives some personality to this composite deck. 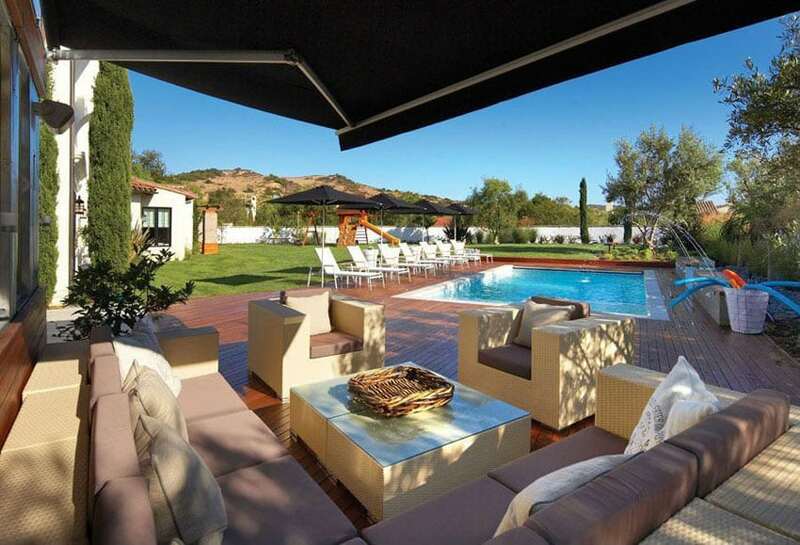 Additionally, the black coffee table and al fresco dining set are also good furniture choices for this outdoor space. 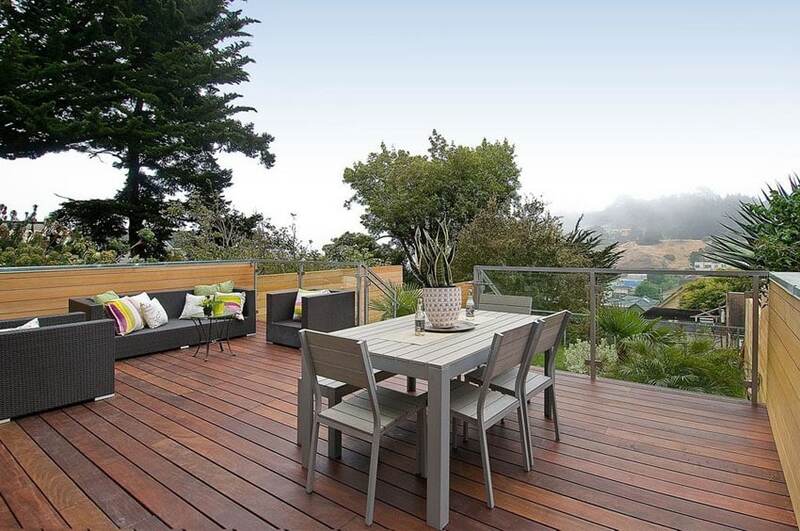 Amazing views of the bay can be seen from this example of luxury deck design. The planters, metal railings, and white lounge chair are also beautiful additions to the area. The contemporary design of the house and its backyard composite deck are further enhanced by the picturesque hillside views and lush greenery that surround this outdoor area. City view are equally as amazing as nature views. 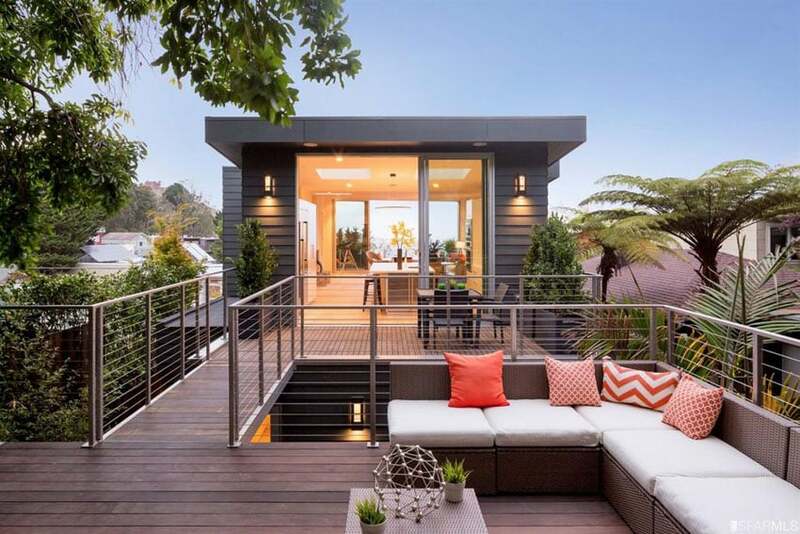 This contemporary deck design takes full advantage of its placement on the roof of a building by providing adequate seating to really create a space for social gatherings and lounging. 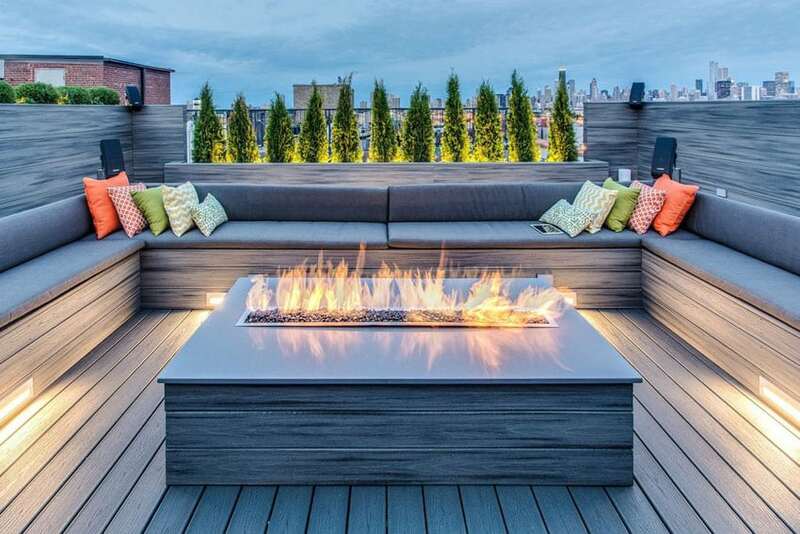 The U-shaped bench seating of this contemporary deck surrounds a cozy and modern gas fire pit design, to protect users from the cold weather common in roof-top decks such as this. 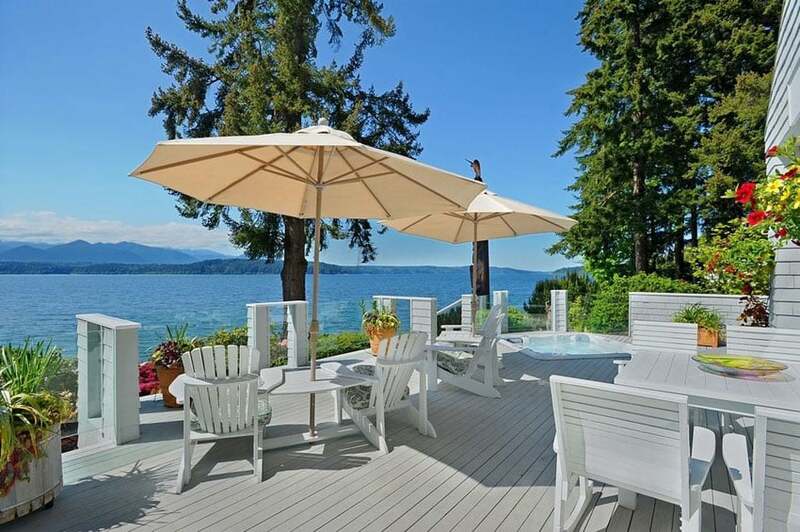 The organic, custom deck design was made specifically for waterfront enjoyment. 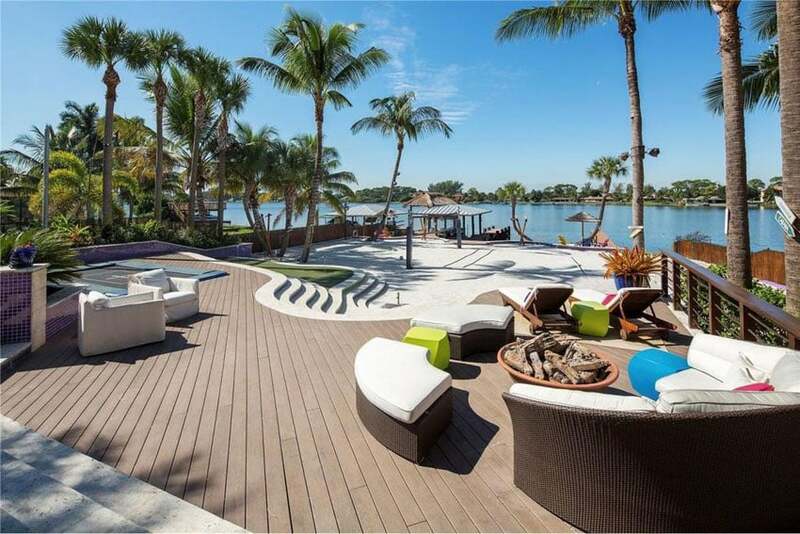 It has amazing bay views, beautiful palm tree landscaping, and modern outdoor furniture that gives this space a high-end tropical feel. This cozy little deck employs warm-colored wood, home gardens and plants, and a quaint outdoor bar that all come together to create an outdoor space that feels like home. The pergola and benches on this wood deck give you a nice space to really get to appreciate the beauty of nature seen all around the deck. 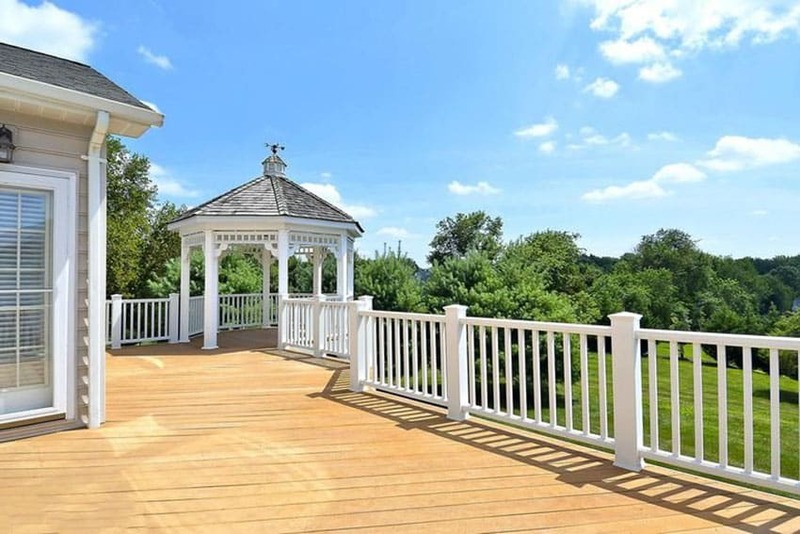 The classic design aesthetic of the white-painted gazebo, as well as the white railings, give this roof deck a rustic, yet high-end feel not often seen anymore nowadays. 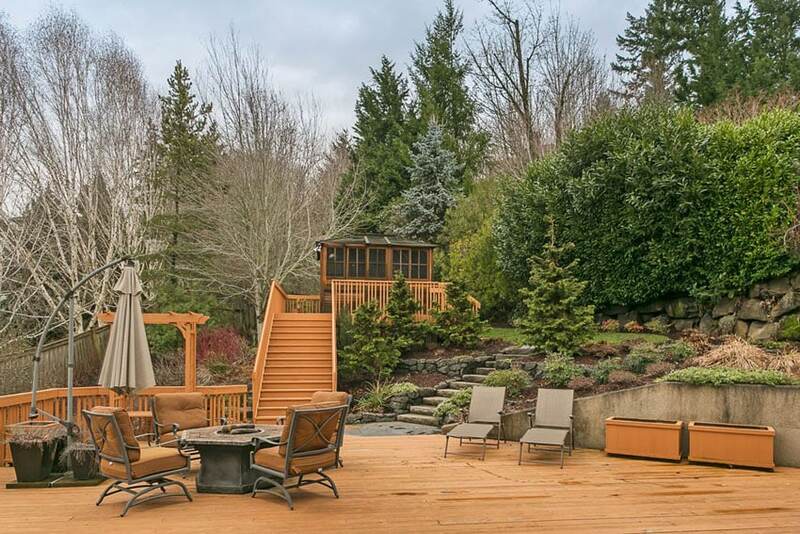 This elevated wood deck is tucked against a small hill in the backyard of a home. With a rustic brick retaining wall and modern wicker furniture to adorn it, this wood deck feels intimate yet fresh. 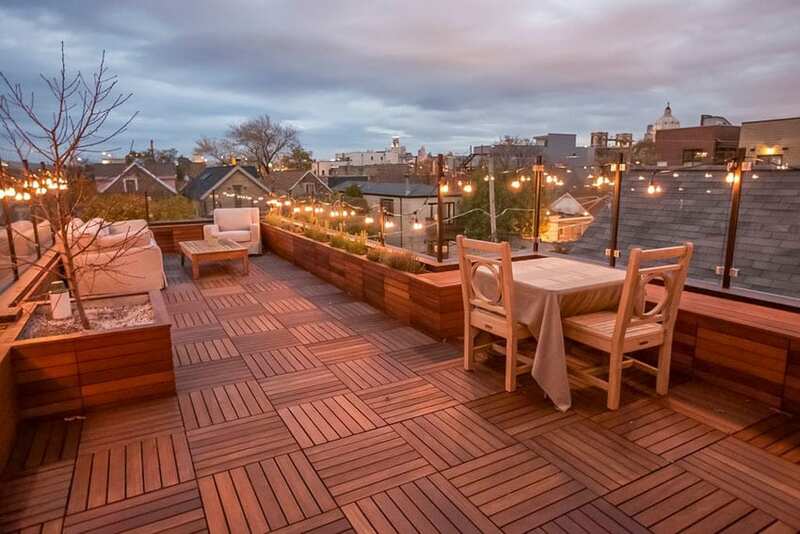 Wood is the material of the hour for this roof deck design. From the standard block wood parquet flooring to the wooden raised planters and furniture, this deck creates a warmth that goes perfectly well with the warm outdoor lighting used in the space. 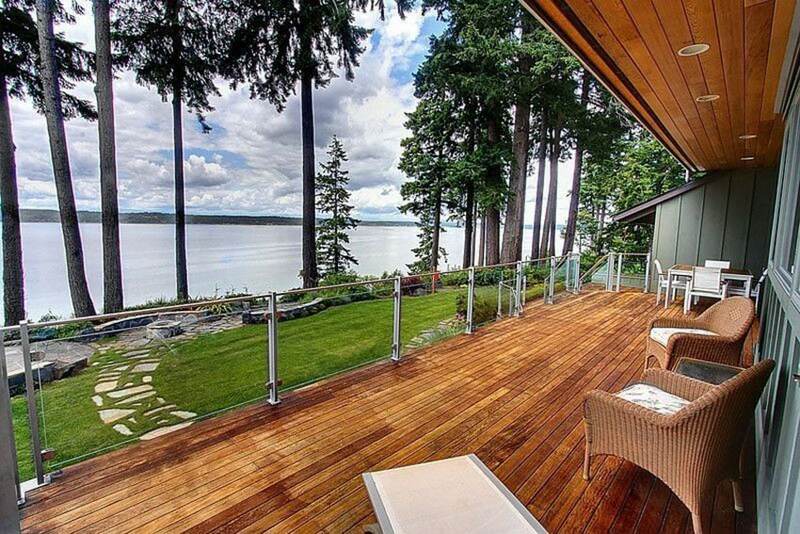 The lake views from this lakeside deck are almost framed by the trees that line the shore. The glass railings used on the deck make sure that none of the amazing vistas are blocked. A rough stone walkway leads to a stone fire pit for perfect lake views and outdoor entertaining. 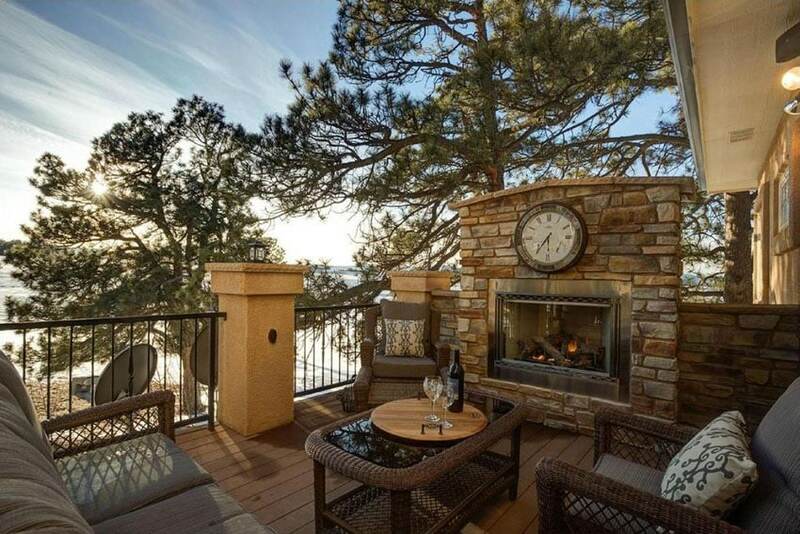 The outdoor stone fireplace and the lake views off of this cozy wood deck make this the perfect place for the homeowners to unwind after a long day. 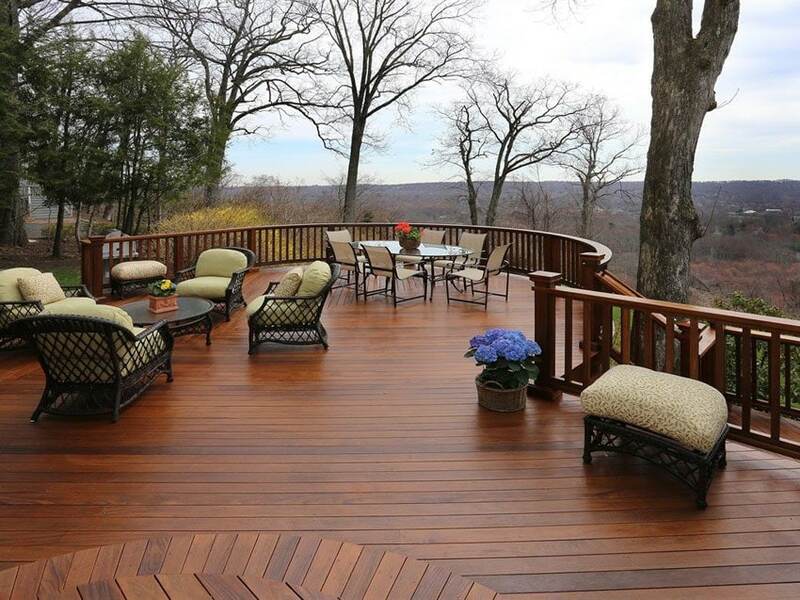 Luxury decks look most impressive when they maximize a backyards views and enhance the available living space. In this backyard, the swimming pool and gazebo were added to take advantage of the sheer floor area of this large elevated wood deck. The use of wooden and wicker seating furniture also give this middle-of-the-forest lounge space some charm and warmth. 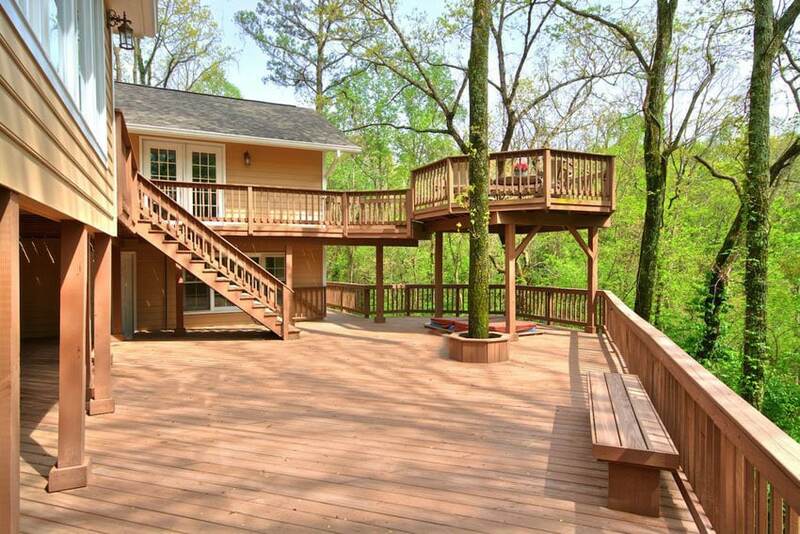 Two-level decks such as this one really take advantage of vertical space and maximize usable floor areas. Giving the space two balconies also lets you appreciate desired views and outlooks of the surrounding trees all the more. 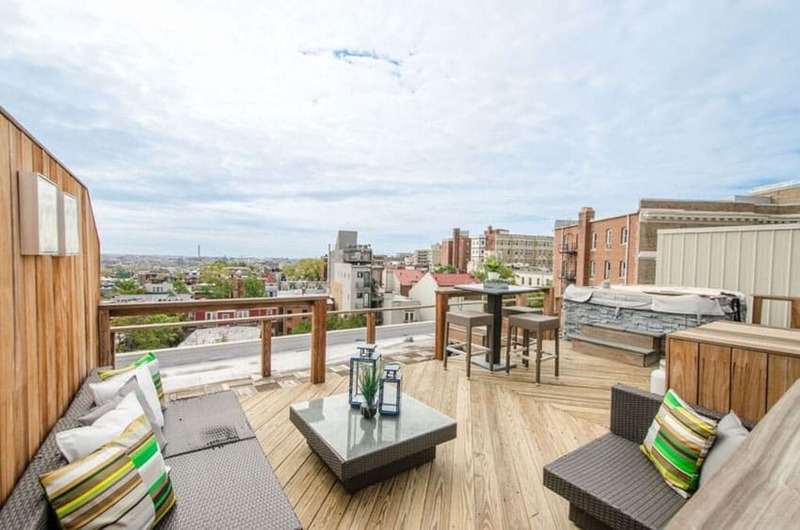 This luxury deck uses modern chairs, sleek glass railings, and, most importantly, breath-taking views of the city to really create a unique outdoor space and experience. 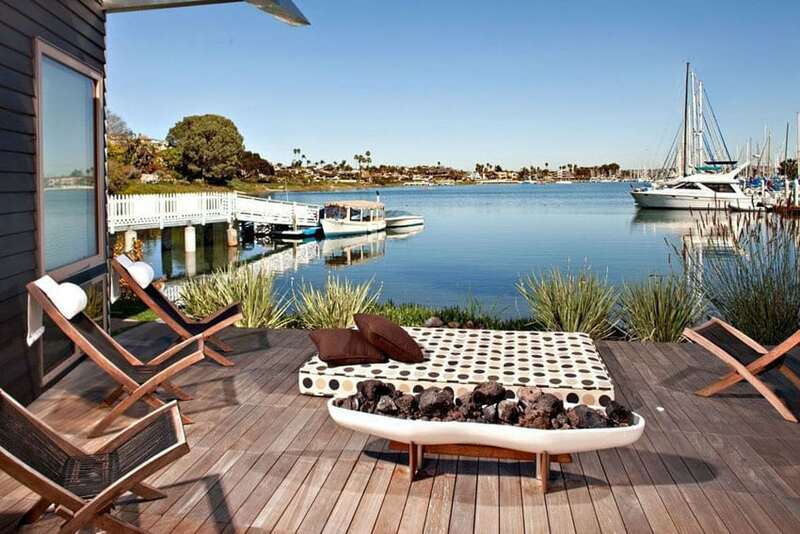 The gray-painted luxury deck almost seems to kiss the water in this waterfront design. 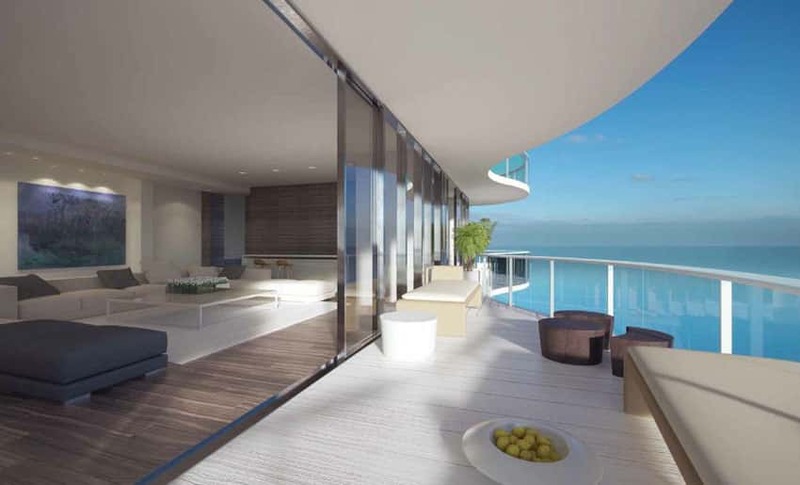 The picturesque views are complemented by the white outdoor furniture and the clear glass railings of the design. Modern homes do well to have modern deck designs. The choice of bamboo landscaping, the zen design of the planters and outdoor lounge chairs, and the overall peaceful aesthetic of the space is made for meditation and relaxation. This modern ipe deck fronts the custom swimming pool located behind this cozy abode. The simple yet striking designs of the lounge area seating set and lounge chairs are perfect for this type of setting. 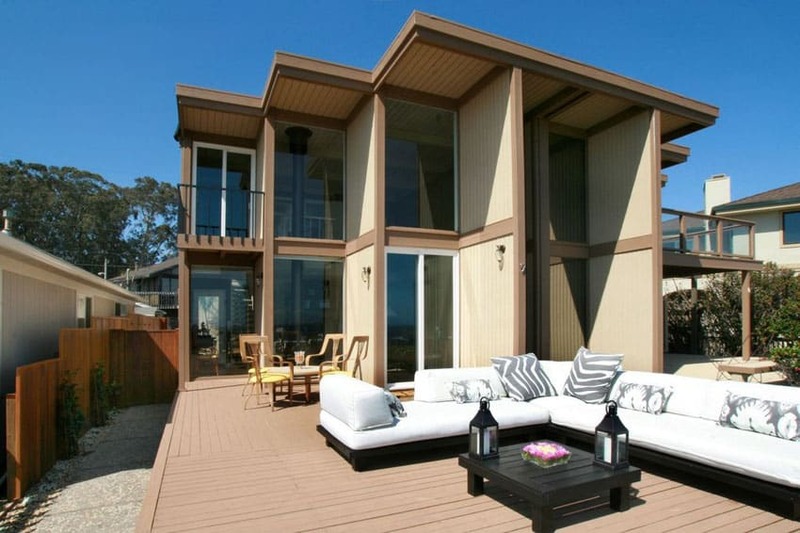 Ocean views are the stars of this contemporary deck design. Its adjacency to the home’s main living room connects these two lounge spaces to almost create one super space that blurs the line between interiors and exteriors. Using multiple levels with outdoor decks effectively segregate the space and creates a unique design experience. 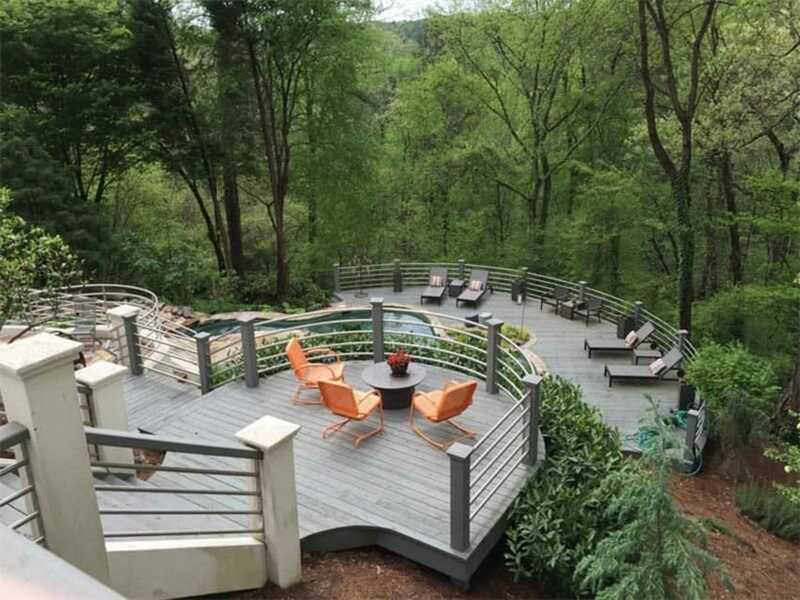 He metal railings, ashen gray decking, and pops of color with the furniture really serve to contrast the view of the trees in this hillside design. 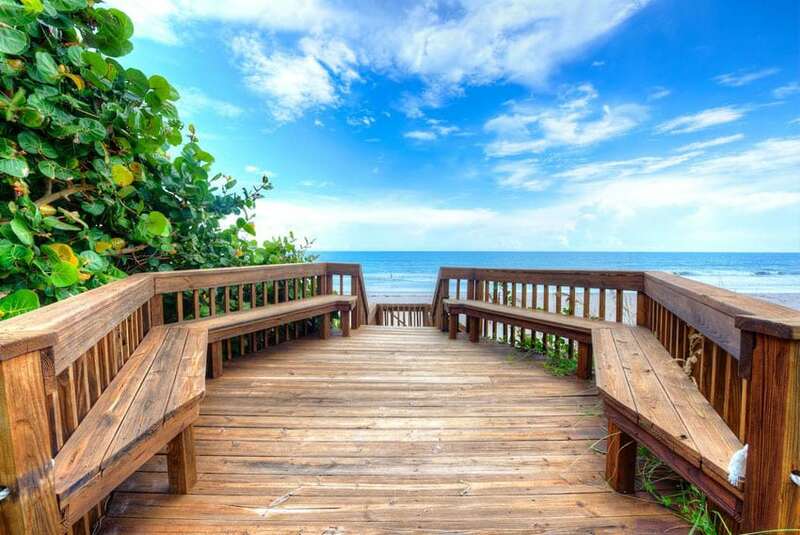 This oceanfront wood deck in Florida is located right on top the white sand beach. The natural tropical palm trees frame the view of the crystal blue waters in the distance. 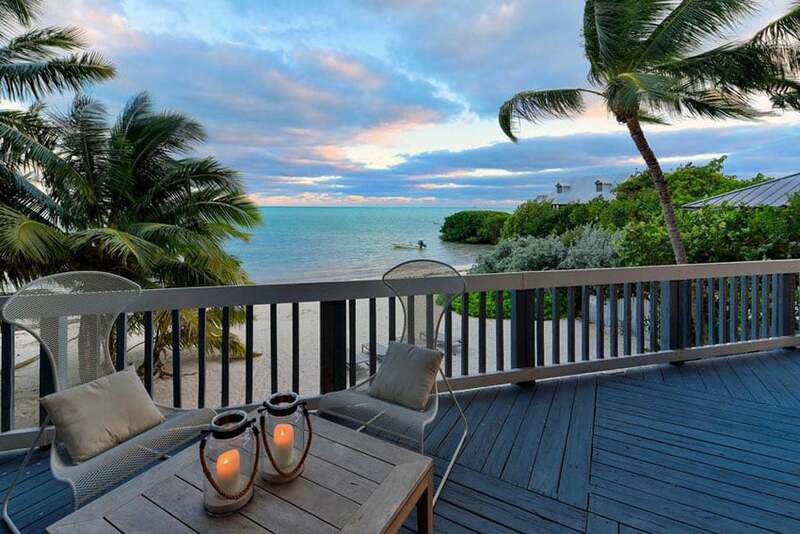 This deck design is the epitome of luxury tropical living. This outdoor deck utilized the smart use of weathered, rustic decking to really give this bedroom deck some personality. 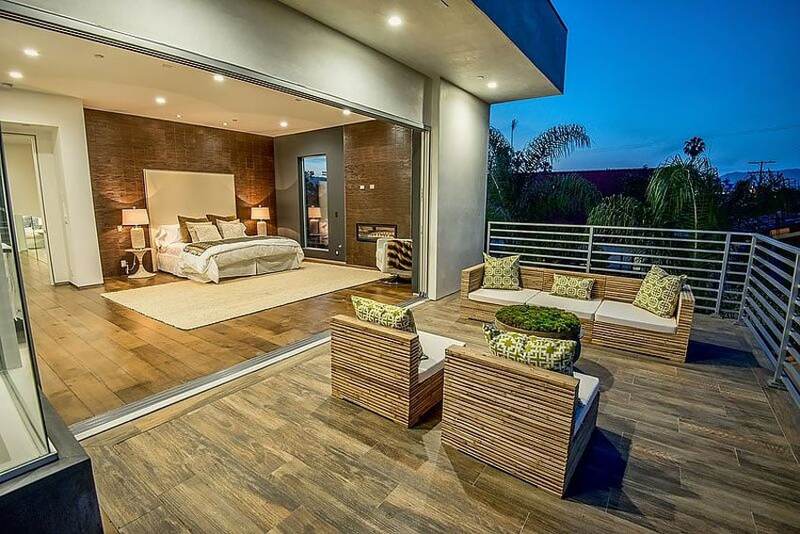 Additionally, the large open doorway that separates the bedroom from the outdoor space, when opened almost seems to join the interior and exterior spaces together. 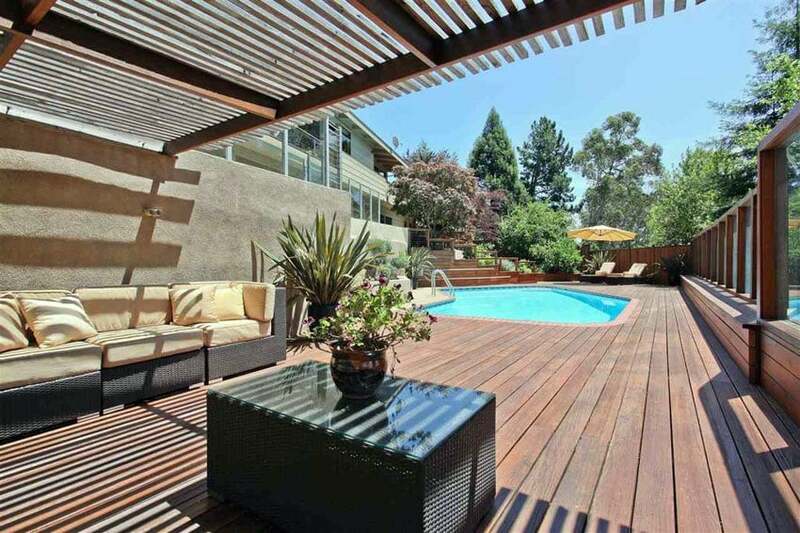 This swimming pool deck design protects its outdoor furniture with tarp canopies. Its adjacency to a nice luscious green yard really makes this space open and spacious. The traditional stain of this wood deck creates a beautiful aesthetic and gives this space a lot of warmth. The circular design also really keeps this space feeling welcoming and cozy. 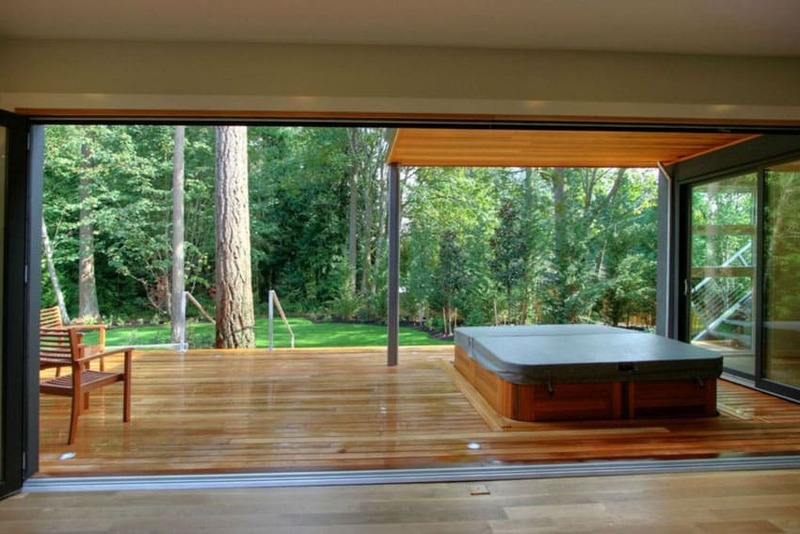 The wide view of the wood deck from the bedroom can also be achieved by using a wide, almost completely open doorway. This also permits the bedroom to have nice clear views of the forest beyond. The wood deck itself has wood outdoor seats and a hot tub. The wood deck of this modern home uses its architecture to provide partial cover. The cushioned wood furniture uses white upholstery to really contrast the warm browns of the deck. This traditional home also has an appropriately traditional wood deck design with white railings, weather wooden decking and benches, and wrought iron cushion outdoor seating. It is located on the corner of the house, giving it some shade, adequate wind breaks, and a cozy feel. This elevated wood deck located in the backyard of a large modern home uses the support of stilts to keep itself level with the rest of the house as well as the patio design with pool. 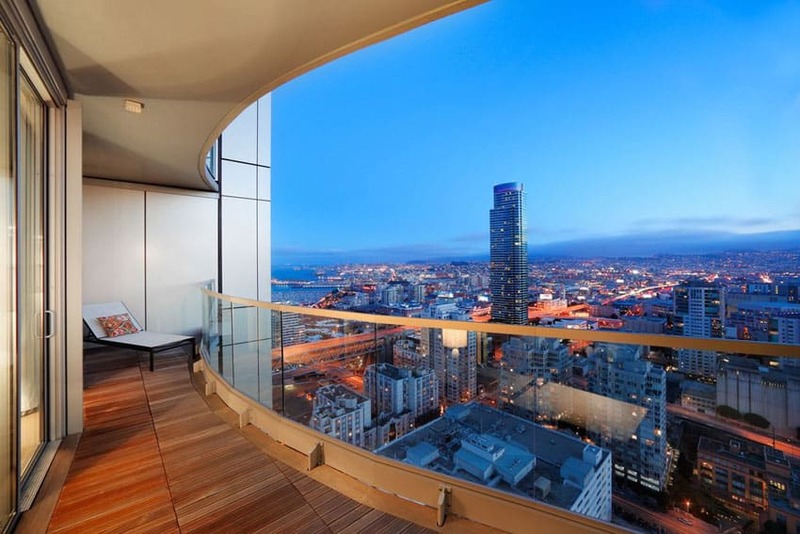 Penthouse apartments can have outdoor luxury decks as well. 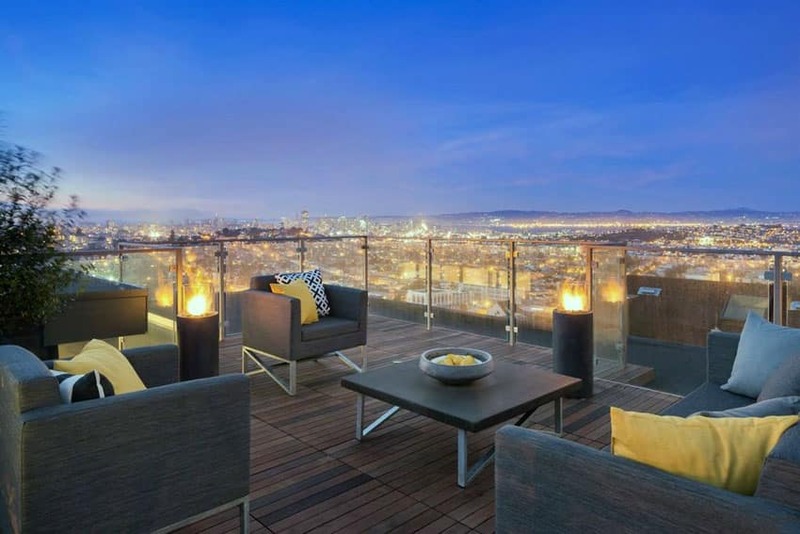 In this example, amazing city view can be appreciated on the minimalist lounge chair of this deck. The unique use of an outdoor day bed really creates an amazing lounging experience for this bay-side wood deck. A modern lava rock fire pit creates an alluring night time ambiance. The relaxing views of the water and the marina is an inviting place to enjoy day or night. The pergola on this wood deck serves as adequate sun shading for the lounging space accented by the wicker cushioned couch and glass-top wicker center table. 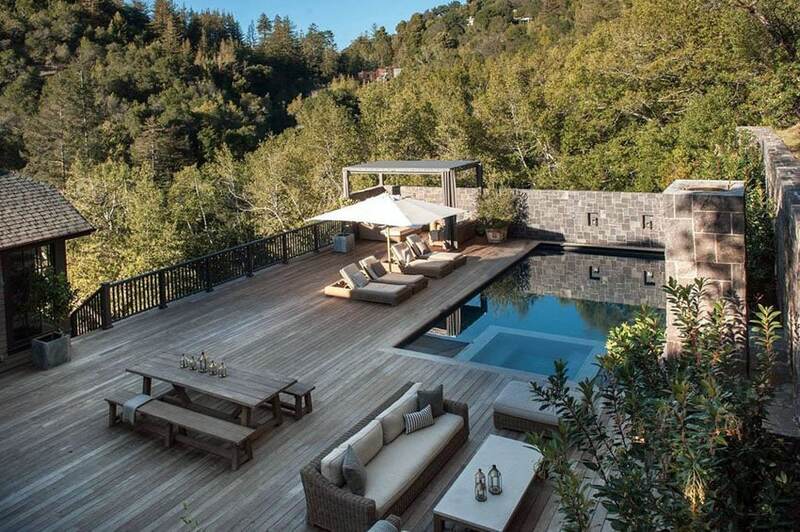 The wood deck also surrounds a personal backyard swimming pool. 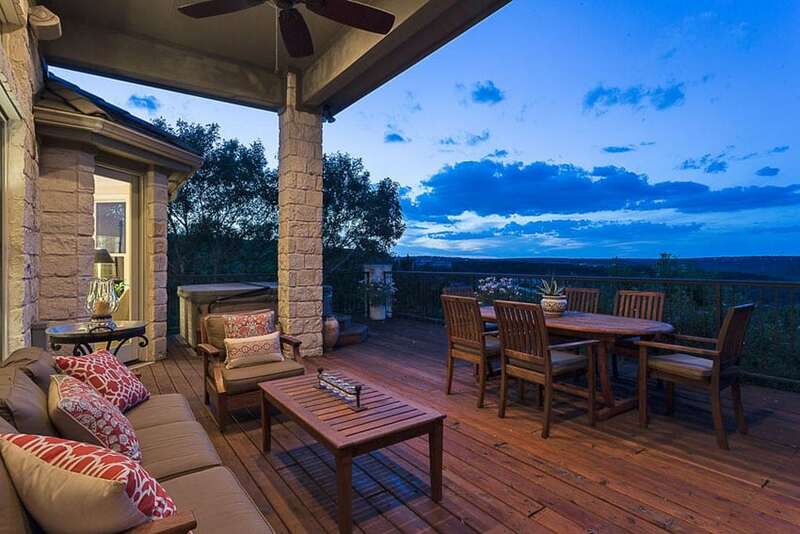 The amazing hillside views seen from this wood deck can be fully appreciated with the outdoor dining table and chair set as well as the wicker outdoor sofa and arm chair set. The use of glass railings also makes sure there is no obstruction to the views. 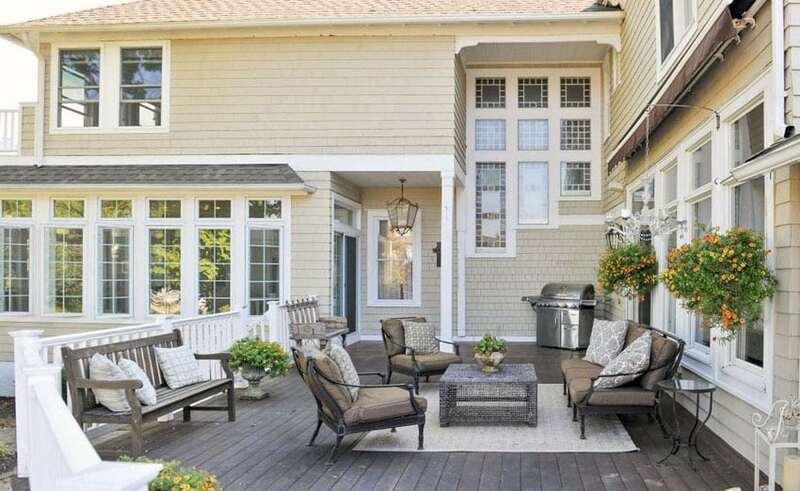 The patio area of this wood deck uses cushioned seating and brightly colored throw pillows. The ceiling fan is also a nice modern touch. The outdoor dining table gives the homeowners al fresco dining options. The hot tub at the back is also an additional luxury of this space. 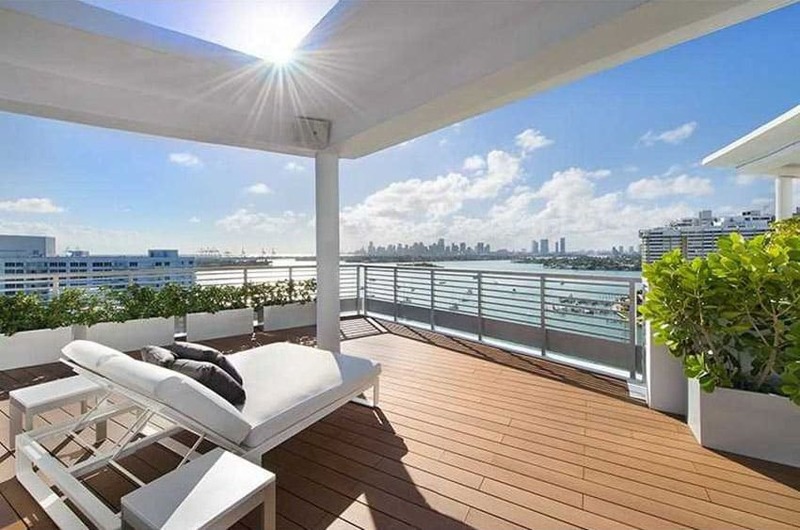 Luxury decks overlooking canals such as this one are undeniably beautiful. 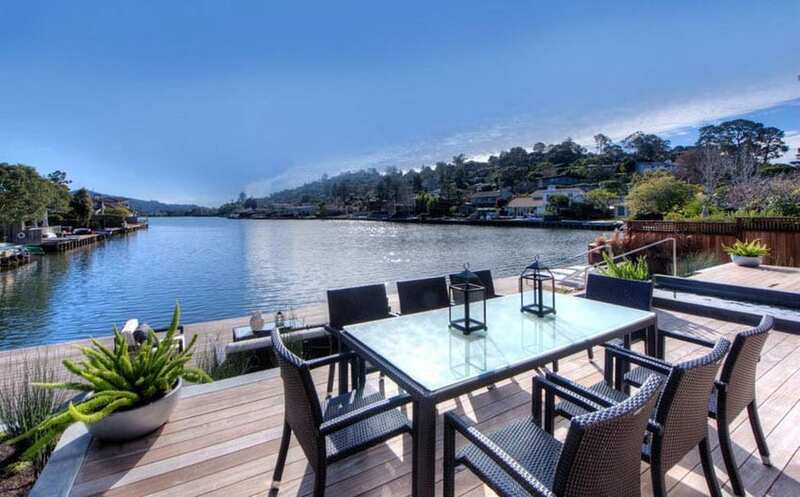 This multi-level waterside deck has a wicker dining table set on the upper level, and a couch and arm chair lounge area at the lower level. This wood deck has built in sitting benches made out of the same weather and rustic wood material also used on the decking itself. 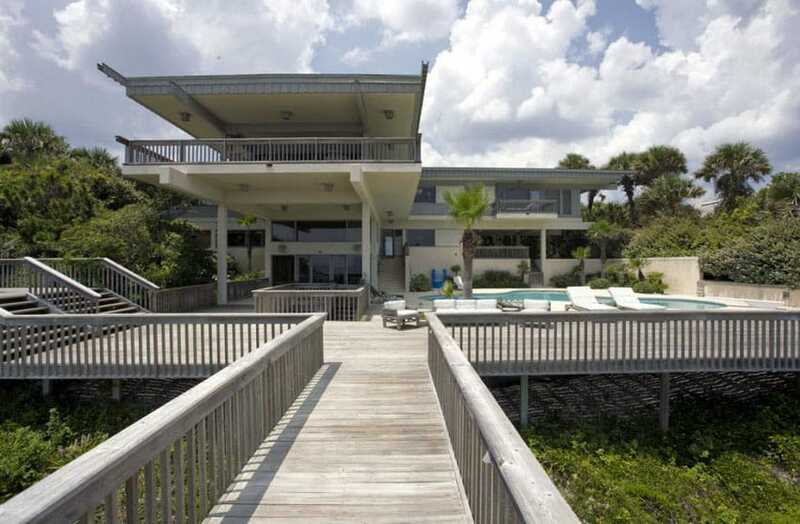 The design connects to a stairway that lead straight to the beach. Stairs were used to connect the wood deck to the small cottage, both of which are located in different levels. 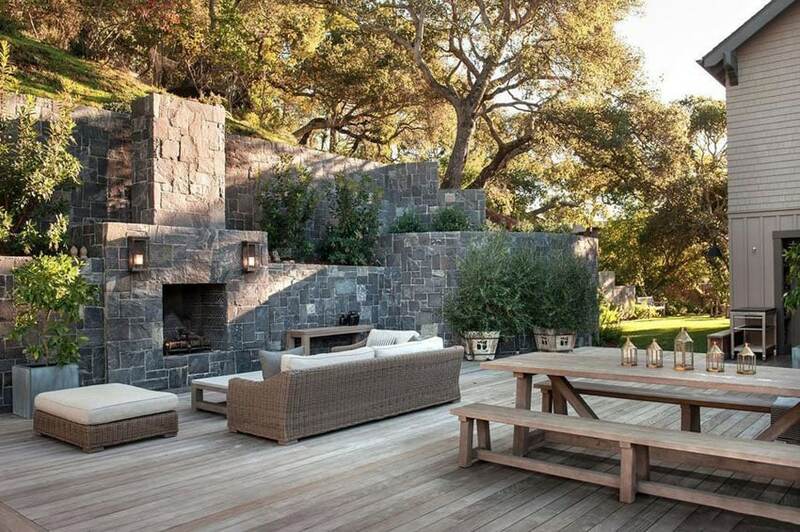 In addition to the use of stone and pine tree landscaping, the deck also uses a variety of beautiful outdoor furniture to liven up the space. Many backyard deck ideas originate from the goal of sitting around a focal point such as a fireplace, fire pit or water feature. The deck above is a nice juxtaposition of stone and wood, with its grand stone outdoor fireplace serving as its focal point. The white cushioned wicked couch and ottoman set is complemented by the picnic table and benches located behind it. Sunken conversation pits are typically seen used in living rooms, but in this wood deck design, it can be seen used outdoors. The ashen gray wood decking and railings go extremely well with the olive green of the seating cushions. 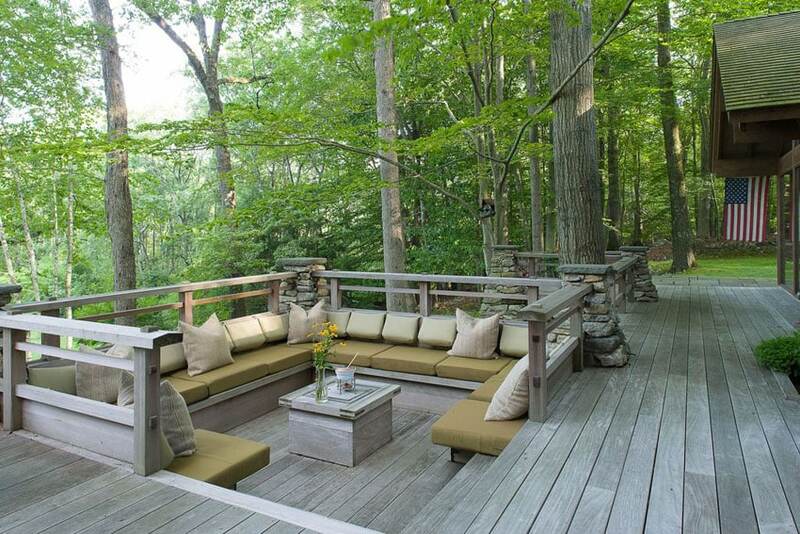 Visit this gallery page for more wood deck ideas for your backyard.